You repeatedly make demonstrably ludicrous assertions about subjects of which you have little knowledge, are then provided corroborated evidence of the actual facts, you refuse to acknowledge the erroneous nature of your hypocritical and untrue comments by digging in your heels in an ambarrassing effort to sound as if you know what you're talking about (after you've clearly demonstrated that you don't), then have the audacity to suggest that the OTHER guy has a problem with an inflated ego??? That's one serious Martyr Complex, you're wrestling with. At least you've got excellent taste in comedic parody performers. In some strange, convoluted way, it must be a subconscious complement, on your part. In some strange, convoluted way, it must be a subconscious complement, on your part. You get it , I was getting a bit worried my sarcasm had reached a new point. I however know a lot of something when it comes to technology, you can debate all you would like no matter how wrong you are. In the end my standpoint is this, use what technology you are comfortable with and not everything you read is accurate even if someone quotes many biased articles. No... In the end, you're just backpedaling by now saying that "people should use what technology [they] are comfortable with" immediately after criticizing that "some [people] are stupid enough to believe the hype" by doing precisely that very thing. Now, for your other point... do you have ANY evidence whatsoever to base your accusations of biased reporting, OR... are things biased ONLY when YOU disagree with the findings? I CHALLENGE you to produce the tiniest crumb of credible evidence to support any of your ridiculous assertions (such as they are). You couldn't possibly be more duplicitous if you tried. Freud would have had a field day with you, Pal. No, actually what I am saying is just what I had already stated just making another statement to further justify my previous statement. Wrap your head around the statement you made in reply to my statement about slave labor, to me what you wrote trivialized the fact that they still have SLAVE labor. It does not matter if they addressed the issue or acknowledged it 4 years back or 2 years back, it is still happening today and it is not my opinion it is FACT. When you discuss a product such as an IPhone and search sites that are in a direct relationship with Apple such a "appleinsider" and "thinkprogess" you will not get a truly honest review. Reading news sites that are purely apple biased would be akin to watching Fox news and taking every word they say as the truth. Out of the 10+ tech web news sites that I read daily sometimes they conflict on what is real and opinion it is up to me the reader to decide for myself. First hand example, one of my kids own a IPhone 6+, another owns a Galaxy 6, and I have a Lumia Icon.. Go and compare the handsets online and tell me what you find when it comes to camera quality.... See if it lines up with my next statement, Icon wins. At home we could do a review all day long on the pros and cons of each handset since my household has all 3 but in the end it is our opinions vs others. Go and compare the handsets online and tell me what you find when it comes to camera quality.... See if it lines up with my next statement, Icon wins. Do you mean THESE reviews? The iPhone clearly has more natural color and a far greater tonal range. Given the choice, any half-serious photographer/videographer would almost certainly pick the iPhone. As far as white balance, both are slightly off-gamut. Icon is too cool and iPhone is too warm. But photographers/editors virtually always adjust photos to the "warm", because of the more naturally appealing hues. No doubt, a person should buy what best fits their needs. But your original point was that iPhone cameras were somehow inferior. My point is, and I've presented credible evidence to support the fact that your spec-based criteria for asssesing camera performance is not only completely untrue, but so is your statement. In fact, in most every way that's important, it's better than most, INCLUDING the Icon all things being equal). I suggest that you read this. Unless of course The Verge doesn't meet with YOUR notion of a non-biased source. to me what you wrote trivialized the fact that they still have SLAVE labor. It does not matter if they addressed the issue or acknowledged it 4 years back or 2 years back, it is still happening today and it is not my opinion it is FACT. 1) Then you're misinterpreting what I said. 2) It is certainly NOT slave labor, however grossly distasteful it may still be. Nor is it anymore Apple's Doing that it is WAS Nokia's, nor any of the dozen or so other major companies using Foxconn. 3) Yet YOU were the one to bring it up as part of your argument. 4) It is NOT happening to the degree that you are representing, so, NO, it is in deed, NOT a fact. You'll get no argument from me about the disgusting realities of labor practices around the globe. I'm one of the biggest critics of NAFTA and the current state of the global economy (but not global economy per se). I try to make change where I can by doing things like not voting for those who would most contribute to such practices. I try to buy products from better, more responsible companies, I'm exceedingly careful to consider damage to resources, etc, I leave a comparatively small footprint on the planet. I'm politically active and try to put my money where my mouth is. Until you surrender for recycling, your cars, technology and anything else that was made in such factories (especially in Asia), you're simply in no position to lob theses criticisms because you're equally as guilty of supporting such practices, and that makes you a raging hypocrite. [quote=Timbo]When you discuss a product such as an IPhone and search sites that are in a direct relationship with Apple such a "appleinsider" and "thinkprogess" you will not get a truly honest review. Reading news sites that are purely apple biased would be akin to watching Fox news and taking every word they say as the truth. Out of the 10+ tech web news sites that I read daily sometimes they conflict on what is real and opinion it is up to me the reader to decide for myself. Oh, c'mon, get a grip... Just because something features content about a specific subject does NOT by default make it biased. It certainly has no right to be compared to political propaganda outlets. If you've ever spent ANY substantive time around AppleInsider, you know that they're some of the harshest critics of Apple and it's products. Performance is established by corroboration though direct, real-world observation, not thru running meaningless tick-lists. You have a compulsive proclivity for insisting others should take as gospel, utterly non-disseminating specification lists, while simultaneously discounting out-of-hand, learned articles, professional experience and credible citation. The very DEFINITION of BIAS. The iPhone clearly has more natural color and a far greater tonal range. Given the choice, any half-serious photographer/videographer would almost certainly pick the iPhone. As far as white balance, both are slightly off-gamut. Ideal is too cool and iPhone is too warm. But photographers/editors virtually always adjust photos to the "warm", because of the more naturally appealing hues. Oddly enough I am a member of 2 of those sites and if you read the comments from Neowin they are pretty blunt on how it isn't the same lighting or in some cases angle and zoom. Some of the comments included "Not an accurate comparison, the iphone 6 is either closer, or zoomed it to the object. Need to take same / same pictures" or "Different angles, pure marketing here." The first reply on digital trends was "this is a clearly biased article by a pathetic isheep" fanboy"
Good article on the Verge and a pretty accurate statement of "Carriers are keeping the odds stacked in Apple’s favor, too"
With all that aside in my house we have all decided that the Icon takes the best outdoor day/night pics, the IPhone takes the best indoor pics and the G6 takes the best action pics. Oh horsecrap they are spoon-feeding the readers what they want them to believe. As long as it's GOOD coffee, I'm in. Which brings me full circle to ask you to explain the logic underlying your original comment. Or had you just not had your coffee, yet? Yikes guys. And here I've been leaning toward the Samsung Galaxy S7. Oddly enough I am a member of 2 of those sites and if you read the comments from Neowin they are pretty blunt on how it isn't the same lighting or in some cases angle and zoom. Some of the comments included "Not an accurate comparison, the iphone 6 is either closer, or zoomed it to the object. Need to take same / same pictures" or "Different angles, pure marketing here." Then frankly, each of those commenters is an abject idiot. Anyone can plainly see that they are indeed taken at the same time, in the same light under the same conditions. The apparent differences, are clearly a result of the camera's unique idiosyncrasies. They have no way of knowing wether the zoom is the same or not. Not without a close analysis of each respective lens. We're on MY turf here, D. I have more than a little expertise in these matters. I'd hate to think that you're in agreement with them. That would go a loooong way towards undermining your credibility, as well as theirs. I'll just write it off as one more lame attempt at frantically defending your indefensible comments. You seem a bit edgy tonight perhaps its time to switch to decaffeinated, if you look at the picture of the xbox controller you can clearly see its quite a different picture. What turf are you discussing, FL1 (unless your initials are JS or JU or TP that's not happening) or phone tech in general? I am no expert in phones nor will not admit to knowing more than I read or have had hands on experience with. if you look at the picture of the xbox controller you can clearly see its quite a different picture. A different picture taken on a smartphone with a better integrated camera, The background is the same, the lighting is the same and the shadow halo is the same. The only difference is the clarity. The aperture simply has a different (read BETTER) focal length for macro shots (note the fisheye-lensing effect). The obvious color variations are a result of the camera and it's limitations. As far as sharpness goes, the "zoom" as you incorrectly refer to the macro, is far, FAR superior on the iPhone. High-rez photography has been one of the main professional tools in my arsenal for over 40 years throughout my military and civilian career. The process of photographic technique is expertly within the wheel well of my professional skill set. To a trained eye, the iPhone CLEARLY does more overall with superficially less, than does the Icon. Not every phone is a winner. Check out the handsets that will only crush your mobile dreams. 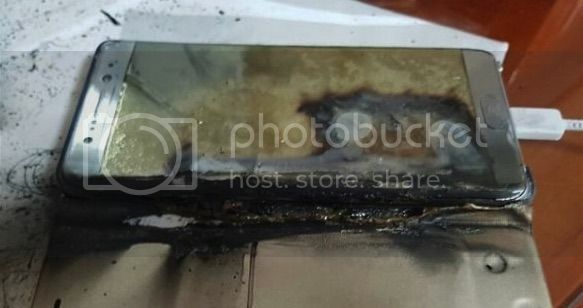 ... the Samsung Explode-o-Phone aka the Samsung Galaxy Note7. Probably Rejected All That Android Malware.